Seeking refuge from the hot Mediterranean sun can be difficult in a country known as a mecca for beach life and "tan-atics" but the Maltese Islands hold a secret - and a very lush, beautiful one it is too. 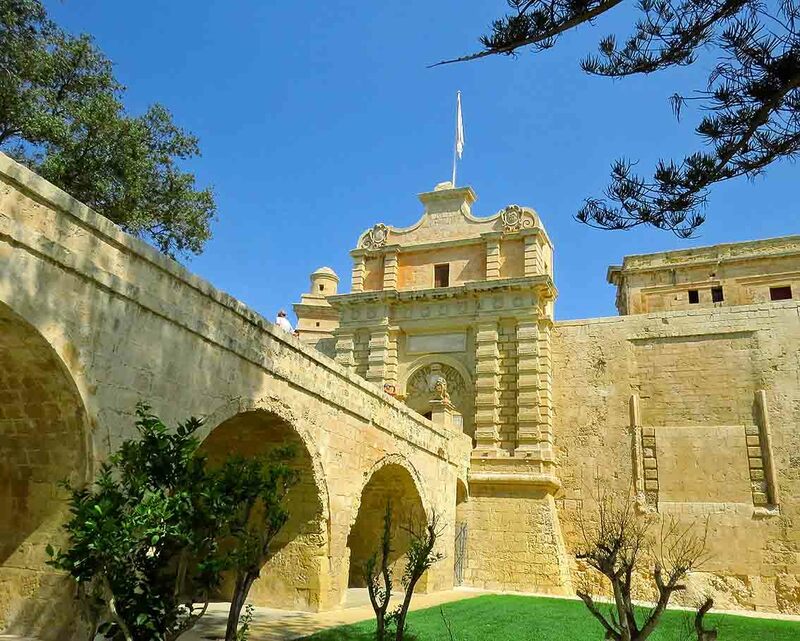 What's more, this secret offers respite from your otherwise very active holiday of sun, sea and sight-seeing; for there are things other than historical buildings and archaeological sites which are firmly rooted in the Maltese past. Tucked amongst the striking limestone, are a variety of public and private gardens which are enviably perfect. These have a long history here - with several of the oldest ones having been established when the Order of the Knights of St John was in its heyday. 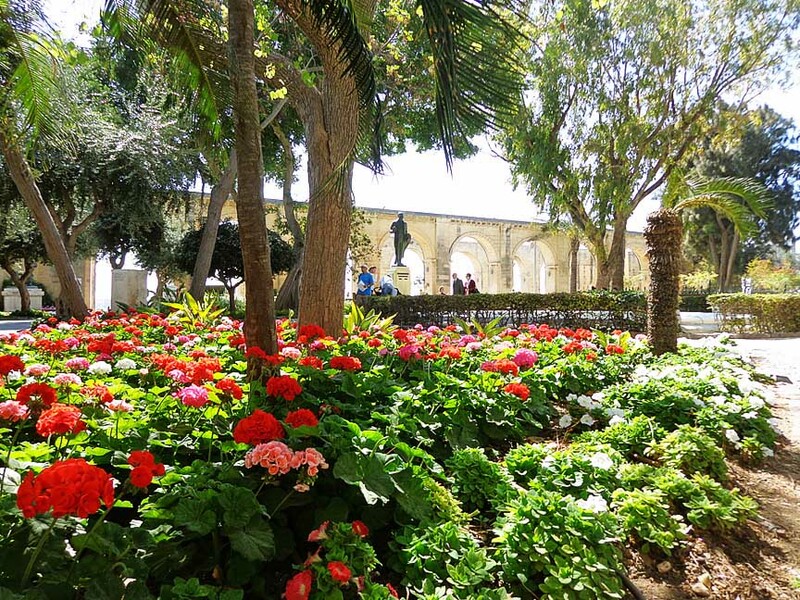 A late example of the Knights' love of gardens are the Argotti Gardens, in Floriana. 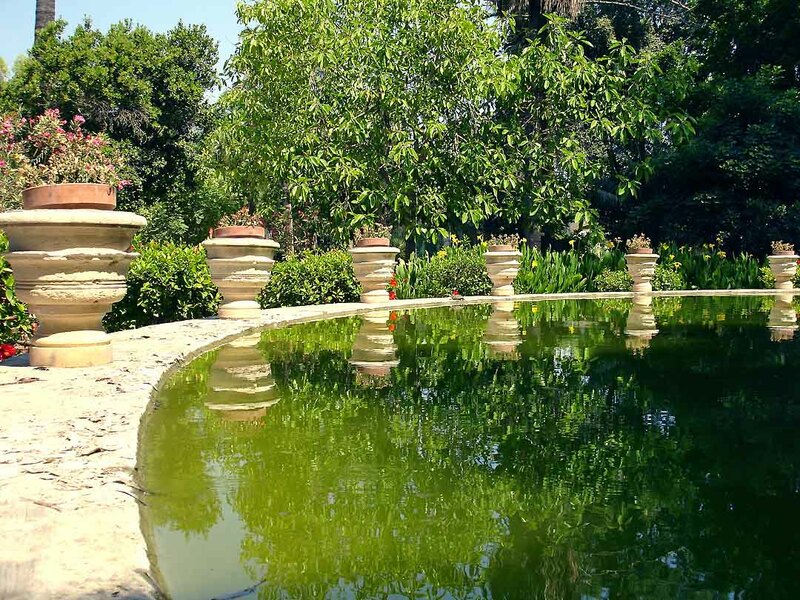 Originally intended as a private garden belonging to Grand Master Pinto in the 18th century, the gardens became botanical a century later, with a rich collection of trees and shrubs from oaks to oleanders and potted plants, especially cacti. The gardens also hold a variety of water features - fountains, ponds and water towers, while an exquisite gazebo dating back to 1741, which is open only during office hours, enhances the place with its stately elegance. A small horticultural museum also exhibits seeds, plant pressing equipment, gardening maps and records. Just down the hill from Argotti, lies the little known and much less visited Sa Maison Garden. This small, pretty garden has a military heritage and is also known as 'il-Gnien tal-Milorda' (Her Ladyship's Garden) in memory of Lady Julia Lockwood, who resided there between 1842 and 1856. Her house was later demolished and the garden taken over by the military, which were responsible for its maintenance until 1903, when it was taken over by the civil government. Laid out on several levels, one can find several regimental crests, which are engraved in the bastion wall inside the garden, a small model of a castle carved in Maltese stone dedicated to the 2nd Battalion of the Essex Regiment and a Knight's Gardjola (watch tower), which is easily accessible and provides spectacular views of the Ta' Xbiex Yacht Marina and fortifications. Also overlooking Marsamxetto Harbour is Hastings Garden, an attractive city garden set on the bastions of Valletta with views of Manoel Island and Msida Creek. The garden also houses a monument built by the Hastings family dedicated to Francis, Marquis of Hastings. Lord Hastings was Viceroy of India until his appointment as Governor of Malta in 1824. In 1827, he died in a ship en route to Naples and his body was returned for burial in this garden. His daughter, appropriately called Flora, wrote and collected several pieces of Maltese-based or inspired music during the family's stay on the island. To the other side of the Valletta peninsula, the Upper and Lower Barrakka Gardens grace the bastions overlooking the Grand Harbour. The Lower Barrakka perches on the bastion edge overlooking the entrance to Grand Harbour, commanding a superb viewpoint from the harbour mouth over to Fort Ricasoli, Bighi Palace, Fort St Angelo and the creeks of Vittoriosa and Kalkara. Among the trees stands a monument for Sir Alexander Ball, who took over when the British besieged Malta following its brief two year occupation by the French and later became the first Civil Commissioner of Malta until Sir Thomas Maitland was made Governor of Malta in 1814. Across the street from Castille Place, the Upper Barrakka Gardens offer unsurpassed views across the Grand Harbour over to the Three Cities and date back to 1661, when it was a private garden of the Italian Knights, whose inns of residence (auberges) lie close by. Opened as a public garden in 1824, during WWII the garden suffered much destruction but was restored to its former glory soon afterwards and thanks to ongoing maintenance, it offers cooling shade and peace in the heart of the bustling capital. The paths are lined with and the busts, statues and plaques that chart various personalities and other significant events in Maltese history. Of special interest are the bronze group, known as 'Les Gavroches' (street urchins), by early 20th century Maltese sculptor Antonio Sciortino. Depicting three children hurrying forward, this exquisite masterpiece has a social theme: the extreme hardship faced at the turn of the 20th century. The newly built lift at the Upper Barrakka was installed in 2012 and is a re-instatement of the original lift built there and in frequent use till the late 1960s. From the Valletta Bastions, to the Mdina ones, Howard Gardens form a natural border between Rabat and neighbouring Mdina. Set on two different levels, they welcome visitors to the old capital of the island with formal gardens and a children's play area while at the other end of the garden is a very popular site-seeing spot offering expansive views of the surrounding countryside. The lower level of the gardens is actually situated in the ditch surrounding the fortified city Mdina - originally an additional defensive deterrent, today the ditch, which has recently been landscaped, includes amongst other things, an orangerie and an olive grove as well as two massive Monkey Puzzle trees. On Malta's sister island of Gozo, there is another garden which owes its name to our British colonial heritage - Villa Rundel set in lower Republic Street in Victoria, was established by Governor Sir Henry M. Leslie Rundel and officially opened in 1915. 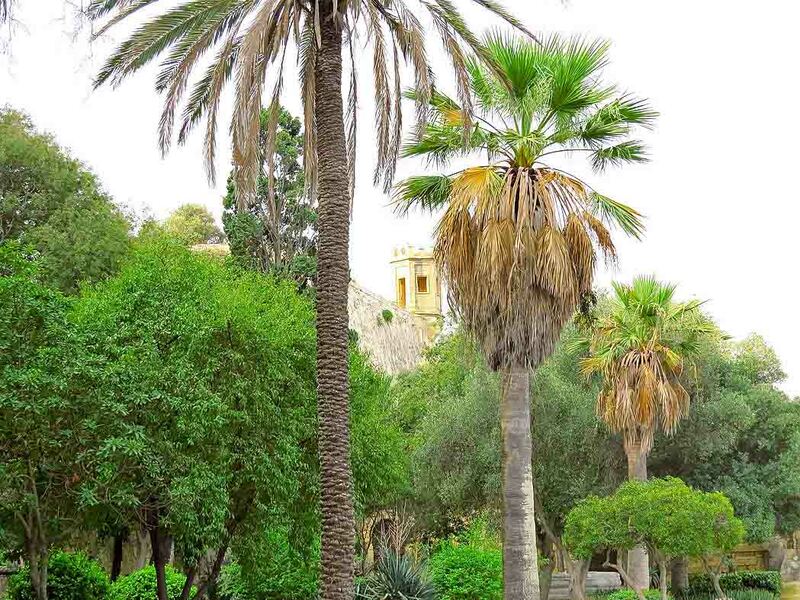 Its Canary Island palms provide soothing shade and the tranquillity around the large fountain is accentuated by the lazy sound of cicadas as this lush garden is a testament to Gozo's more verdant landscape. Three important palazzi of the many which Malta can boast of are Palazzo Parisio in Naxxar, Villa Francia in Lija and Villa Bologna in Attard. All three were former residences of the Maltese nobility and indeed, Palazzo Parisio and Villa Bologna still are. The latter two are often used for private events and functions from weddings to musical concerts and re-enactments, but their piece de resistance are their stunningly beautiful gardens which follow the tradition of Italian landscaping which creates symmetry out of a riot of Mediterranean colours. The same can be said for the state-owned Villa Francia, an 18th century country lodge which, having been fully restored and saved from decay a few years ago, now serves as an official residence of the Prime Minister as well as a venue for official functions and the hosting of visiting delegations. 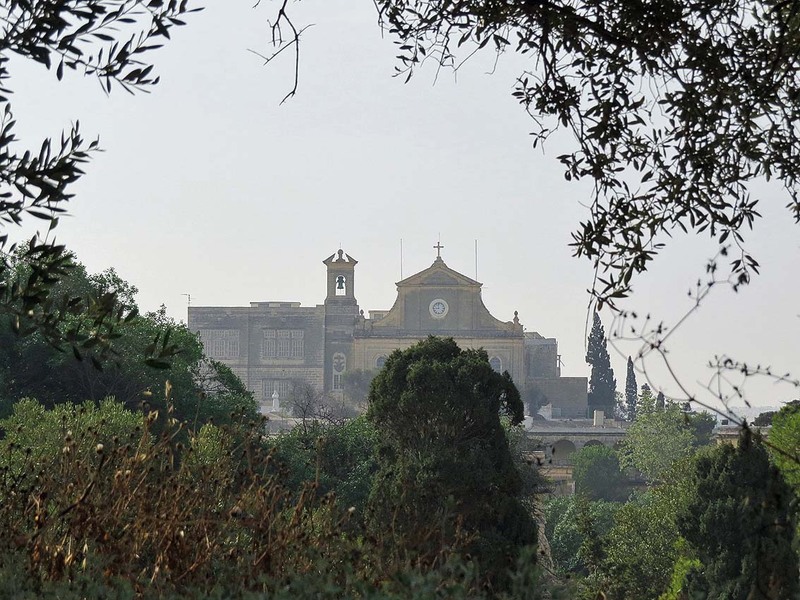 Two other gardens belonging to official Maltese stately homes are the public gardens at San Anton Palace in Attard and Buskett Gardens, surrounding Verdala Palace in a valley just inland from Dingli Cliffs, which was planted by the Knights as a hunting ground. San Anton gardens were laid out by Grand Master Antoine de Paule as grounds to his summer residence, from 1802 until 1964, San Anton Palace was the official residence of the British Governor, after which it remained a state building and is now the residence of the President of Malta. The garden, which has been visited by countless heads of state, is a botanical delight with mature trees, old stone urns, fountains, ponds and formal flower beds. The immediate peace one can feel in the shade of the Jacaranda trees, Norfolk Pines, Bougainvillea and roses is as soothing as it is magical. An annual horticultural show is held there and during summer, the spacious central court becomes an open-air theatre for drama and musical performances, while the President's private palace gardens are opened a few times a year to host large-scale charity events. Grand Master Lascaris, on the other hand, was the driving force behind Buskett Gardens, which are heavily wooded with native, hardy species like Mediterranean pines. The gardens also hold vineyards, orangeries, olive and lemon groves. There are pathways lined with ivy-clad stone walls and wilder woodland that allows for nature walks and exploration in the mild Maltese climate, making it especially beautiful from October to June, when the feast of L'Imnarja, a folk festival and harvest thanksgiving is held amidst the wild flowers and natural springs which turn it into a great picnic spot. Nothing can compare to the silent serenity that you get when nature enthrals you and sooths your mind and your senses - particularly if this takes place in an island like Malta.